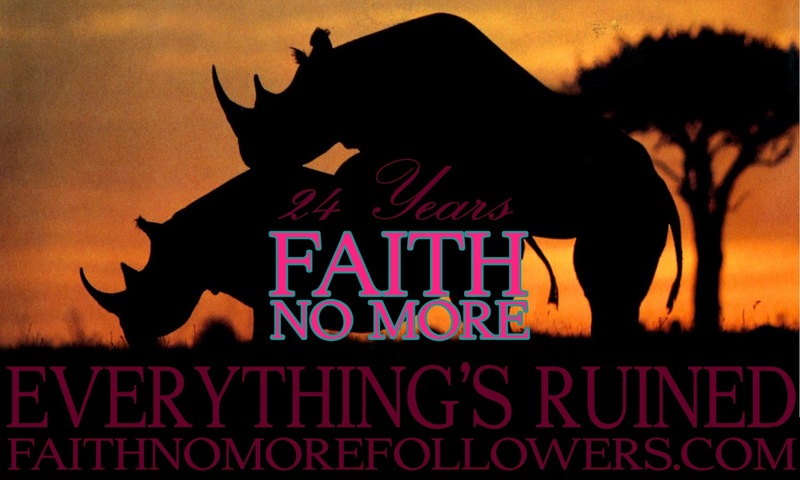 On November 9th 1992 Faith No More released Everything's Ruined, the third single from Angel Dust. In 2005 Q Magazine voted Everything's Ruined number 75 in their list of 100 greatest guitar tracks ever. The music video, directed by Kevin Kerslake who also directed the video for Midlife Crisis, features the band green-screened over stock footage ranging from wildlife shots to baseball games plus a wide selection of other clips. The band at times interacts with the clips, like fleeing from a seemingly-giant tortoise. The extras in the video were found through a competition hosted by MTV Most Wanted. "Warner's spent the video budget on "Small V" and "Midlife" so that when it came time to "Everything's Ruined" there's wasn't much left (!!). It was our idea to take this further and make a video as cheap as humanly possible, in one of those video booths like they had at county fairs, where you sing and dance in front of a blue screen. We didn't quite get to do that, but we got it as close as possible." Locksmith Baltimore Please give me exact testimonial of it. Your opinion is very important for us. Thanks in advance for watching! You can read here my testimonial about your locksmiths device: http://24-locksmith-miami.com/ I think it's will be interesting for you!